One of the best ways to stand out in your interview is to create a 90-day business plan (also called a 30-60-90-day plan) to show employers how you’ll help them in the first three months on the job. Having a plan to learn the job and succeed quickly is going to set you apart from other candidates and make you more attractive to employers. I recommend splitting your 90-day business plan into three sections: 0-30 days, 30-60 days, and 60-90 days. So we’ll actually be creating a 30-60-90 day plan. We’ll divide it into three periods, and you’ll outline different goals and milestones for each of the first three months. I’ll help you do this below. If you prefer to lump everything together into a single 90-day period, that’s fine too. How you plan on learning and succeeding. Which specific steps will you take to reach your goals? In the first part of your business plan, you’ll want to focus on training/learning. The company likely has a training program (if you’re not sure, this is a good question to ask about in the interview). So what is your plan to make the most of their training, and get up to speed quickly? This could include reviewing and studying at home each night for the first week, staying 30 minutes late to review what you learned each day, finding a teammate to have lunches with, or finding a fellow new-hire to review with (if you’re in a training class with multiple people). How will you learn the company’s products/services? If you’re new to this industry, how will you learn the industry/market overall? How will you learn this company’s systems and procedures? (They might have an employee booklet you can review, so include some time to review this in the first 30-day period of your business plan. Your goal in this section is to show them you have a detailed plan and a lot of motivation to learn the basics of the job and understand how they operate quickly. The next 30 days should focus on how you’ll learn and improve by “doing”. By now, you should be able to start using what you’ve learned to perform some of the job duties on your own. And while learning is still a focus here, you want to show them that you plan on being ready to work hands-on and learn in a real-world environment. Also, a big part of this section should be getting feedback from your manager to see how you’re progressing. What is your plan for checking in, receiving and organizing feedback, and using it to improve? Show the interviewer that you’re different – that you’ll take initiative and be responsible for this yourself. Employers love when a job candidate seems proactive and self-starting. In the final 30 days of your 90-day plan, you want to show the interviewer that you’ll be ready to use everything you’ve learned to work independently. You’ll be up-to-speed, contributing to the team’s efforts, and not requiring any more supervision/help than anyone else on the team. You may also want to talk about ways you’ll go above and beyond the basic job duties now. This could include looking for processes that can be improved, finding new ways to help the company get more customers, etc. Also, you can still include steps for getting feedback and continuing to improve. But it should be less of a focus here. The main focus now should be on contributions, independent work, and “taking off” with what you’ve learned. What will you be able to do for them? What will you be contributing after 90 days? When talking about a specific goal or objective in your 90-day job interview plan, try to use SMART goals whenever possible. Saying, “I plan on being very good at serving customers after 90 days,” doesn’t say much. One strategy I’ve seen used very effectively is to divide your main goals for each 30-day period into two different categories: Learning Goals and Performance Goals. You’ll have more Learning Goals than Performance Goals in the first 30-day period. You can also add one or two personal goals, such as having lunch with one new team member per week, or visiting the gym after work two nights per week to stay healthy. Don’t worry if this sounds complicated. Coming up soon I’m going to show you a full example of a 90-day plan for your interview, that you can copy. And in that sample business plan, you’ll see the three different categories laid out (Learning Goals, Performance Goals, and Personal Goals). If you’re comfortable making a good-looking document in Microsoft Word, Google Docs, or some other word processing software, feel free to use that to create your 30-60-90 day business plan. Otherwise, I’d recommend using Canva.com. The website has great templates for creating a PDF, and it’s free to use. I use it myself for creating images and PDF guides for this blog. I’d keep the whole document to 1-2 pages maximum. It’s an outline/presentation, not an essay. Try to avoid long paragraphs and giant blocks of text with no spacing. Make it skimmable and easy to read. (Write your main focus for the next 30 day period here. You should still be learning, but the focus now shifts to taking what you’ve learned and using it in the real world. You want to start doing the work and learning through experience). Have at least two lunches with Supervisors or Team Leaders from other departments to grow my network and better understand how other areas of the organization work. Ask for referrals after each completed sale, and/or after determining a sale is not going to occur. Goal: Obtain five qualified referrals per week and contacting each referral within 24 hours. Join the gym and go every Monday, Wednesday, Friday for one hour minimum. You can alter this example however you want. This is just one way to set up your 30-60-90 day plan for a job interview. If you invest the time into creating a plan like this, it will make you stand out and will boost your chances of receiving a job offer. And once you’ve created a template for yourself, you can re-use it for multiple interviews by changing the basic details to match each job. 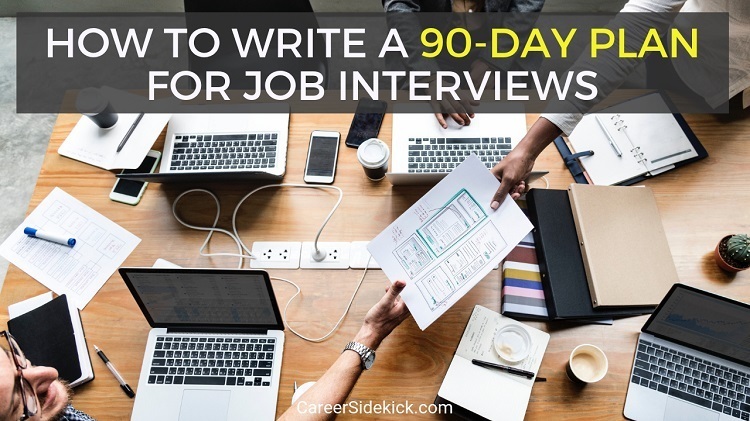 The post How to Write a 90-Day Plan for Job Interviews (Example) appeared first on Career Sidekick.